This monograph contains a study on various function classes, a number of new results and new or easy proofs of old results (Fefferman-Stein theorem on subharmonic behavior, theorems on conjugate functions and fractional integration on Bergman spaces, Fefferman's duality theorem), which are interesting for specialists; applications of the Hardy-Littlewood inequalities on Taylor coefficients to (C, ��)-maximal theorems and (C, ��)-convergence; a study of BMOA, due to Knese, based only on Green's formula; the problem of membership of singular inner functions in Besov and Hardy-Sobolev spaces; a full discussion of g-function (all p &gt; 0) and Calder��n's area theorem; a new proof, due to Astala and Koskela, of the Littlewood-Paley inequality for univalent functions; and new results and proofs on Lipschitz spaces, coefficient multipliers and duality, including compact multipliers and multipliers on spaces with non-normal weights. 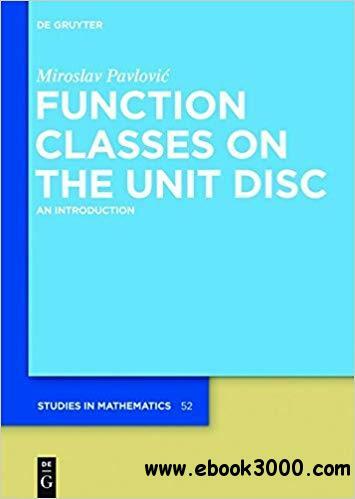 It also contains a discussion of analytic functions and lacunary series with values in quasi-Banach spaces with applications to function spaces and composition operators. Sixteen open questions are posed. The reader is assumed to have a good foundation in Lebesgue integration, complex analysis, functional analysis, and Fourier series.